Why to Adopt a Dog or a Cat? Adopting is always a personal matter. Everyone has their reasons. As veterinarians who treat many pets and cooperate with several animal organizations, we have also our own reasons to adopt. Probably some of them will coincide with yours. Anyone who has pets, or takes care of them, does it vocationally — because they love animals, because they enjoy them. That is how it should be, at least. If you don’t like animals, don’t have them. Ever. Don’t buy a pet if you are going to neglect them, or end up abandoning them. An animal at home is a commitment for life. If you like them but are not sure you have the discipline to take care of them every day, test yourself volunteering at an animal shelter. Walk them, take care of them, feed them, take them to the vet … Learn about all the implications of having a pet and, if you still want one, adopt. If it turns out that having a pet is not for you, there are many ways of enjoying animals without having them at home — you could keep cooperating with the animal shelter, for example. Having a pet takes work, certainly, but is also very rewarding. They are the most faithful and constant friends, attentive to our states of mind, amusing if we know how to play with them, affectionate if we let ourselves be loved. If we establish clear rules, and provide proper distractions, there will never be any inconvenience — on the contrary. No buts. Not only human beings have rights. Independently of the species or breed, all animals have the right to live in the conditions most suitable for them. They have the right to not live poorly. They have the right not to be ill-treated. A hamster can live in a cage — a cat or a dog do not. A pigeon can live on the streets — a cat or a dog do not. In Spain 400 dogs and cats are abandoned daily, on average (article in Spanish). We have the doubtful honor of being first in the charts of pet abandonment in Europe. That means that many people buy a dog without giving it enough thought. Notice: all pups grow — no exception — , and we all animals eat, relieve ourselves, fall ill, age… If you are not ready to take care of them to the end, get yourself a fluffy toy. Of all the abandoned animals, only 44 % are adopted (in Spanish). The rest either remain in refuges all their life, or are sacrificed. In Sant Cugat apparently we are more sensitive (Diari de Sant Cugat, in Catalan), so the rate is lower than in other towns, and the rate of adoption higher. Neither do we sacrifice pets that have not been adopted after a certain period, but that depends on council regulations. There is no national or regional legislation about euthanasia, and there is still a large number of places where it is applied. Don’t think that because in Sant Cugat there are less than 50 dogs in animal shelters at the moment, there is no need to get involved. There are more in many other places: Sabadell, Terrassa, Barcelona… — to mention only some of the largest centers. In spite of the progress made during the last few years, and the many efforts of volunteers working with animals organizations, the number of dogs and cats that are abandoned every year is too high to provide them with everything they need. They lack space, food adapted to every situation, antiparasitic treatments, opportunities to exercise and have fun regularly — and being so many, there is never enough affection for each one. In some cases, the animals arrive to the shelter with behavioral problems, and they can’t be kept with other members of their species. Lacking the human resources to reeducate them — reeducation takes time, as well — the end up isolated in a cage. There are no lost causes; they need dedication, that’s all. With the proper help, all animals are recoverable. People buy too many pets, and when there is demand, there is production. Pups are mass-produced, and the leftovers thrown away. Breeders who breed pups en masse are called “puppy mills”. They mistreat the mothers, keep mothers and pups in unhealthy conditions and without veterinary care, wean the pups too soon, and then transport them like hens. There are puppy illegal traders that introduce them illicitly in Spain, mostly from Eastern Europe. 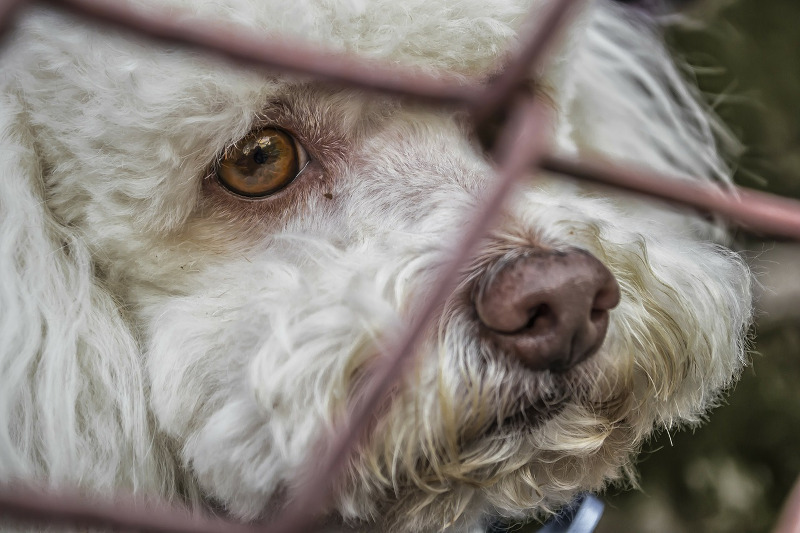 The chances that a pup from a bad breeder has health or behavior issues are higher than in the case of adopted pets, since animals in shelters receive regular veterinary care. Besides, when they have some kind of health problem, prospective owners are properly warned. If you prefer buying to adoption, make sure that the breeder does not abuse the animals. Follow the advice of IHeartDogs.com, or check the lists of breeders credited by the kennel club of your area. Breeders must meet strict requirements to be credited by such associations, in terms of health, housing, and good practices. If you decide to adopt, instead of buying, you will be doing your bit to reduce pet mass-production. On the other hand, there are also many puppies in shelters … They might not be purebred — although some are — but, in any case, it has been established that mongrels are healthier. A purebred dog or cat bred in proper conditions costs at least 800 €. Don’t trust bargains. Depending on the breed, the price might be still higher. Adoption has a cost, too, to cover sterilization, vaccines, and paperwork, but the price range in Spain is 120 € – 200 €. Besides, adoption has a social value. Animals in shelters might have been abandoned for many reasons. What they all have in common is that they did not deserved it. If they were behaving badly at home, the responsibility belongs to the family that did not know how to behave with them, and provide proper training. If they grew and became too big for their owners’ taste, these are the ones to blame, for buying a pup without thinking about the medium-term future. If they fell ill and the owners could not afford the veterinary care, these were the ones who didn’t foresee that a living being can have unexpected needs. If they grew old, and stopped being so funny, the blame belongs to those who treat an animal as a toy, and personal entertainment. Even the owners had a perfectly legitimate reason to abandon them, the animals are not responsible for the decisions of others. Give them the second chance that we all, animal and human, deserve.